Dizigrafix is a small dynamic Cape Town packaging and graphic design studio, with bright fresh ideas and dedicated customer service. We pride ourselves in the conceptualization and creation of all aspects of graphic design from logo, website, brochure, packaging and illustration. It is often that you as a customer will need your product to appear in wide variety of forms and formats. We supply our customers with all the desired and correct material so that they can be used for all their media purposes. We also supply Dtp services to customers needing existing digital or analog material to be converted into the correct format for printing and production purposes. Our designs can be found on the shelves in the market place. Whether you need an existing design revamped or a new concept created from scratch, you will be getting the best service from a senior and experienced graphic designer. We understand the need for you to find a graphic designer who has an extensive insight into the world of marketing and product presentation and creation. From flexible packaging to box design eg. 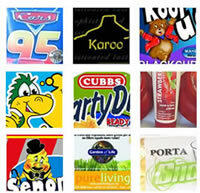 plastic wrappers, crisp packets, pouches, boxes, display units, cartons etc. (from basic to print production). We pride ourselves in specializing in the packaging industry and have a good understanding of the flexible packaging process and the adapting of designs to suit that process. Flexible printing is a dynamic process which allows designs to be printed on all kinds of materials from plastic tubes to cool drink tins and other unconventional materials and shapes. Our designs have been printed by major companies such as Nampak Flexible, Cape Wrappers and Colpak who produce excellent quality printing with both flexible and Gravure printing processes.